Remanufacturing Leader: Nabil Nasr, associate provost and director of RITâ€™s Golisano Institute for Sustainability, began exploring remanufacturing in the late 1980s. Remanufacturing involves rigorous research to make a product useful again. It’s safe to say that nothing lasts forever. Fortunately, the useful life of many products can be extended through remanufacturing, which saves energy, reduces waste and pollution, conserves natural resources, creates jobs, and saves money. “Reman is the rebirth of a product,” said Nabil Nasr, associate provost, director of RIT’s Golisano Institute for Sustainability (GIS) and founder of the Center for Remanufacturing and Resource Recovery (C3R), a research unit of GIS. 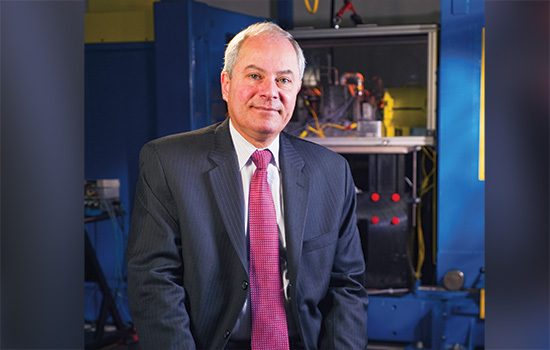 Nasr, an expert on the subject, began exploring remanufacturing in the late 1980s, about the time he joined the faculty of RIT’s Kate Gleason College of Engineering. Since then, the field has grown significantly. U.S. production of remanufactured goods is more than $43 billion, supporting 180,000 full-time jobs, according to a 2012 report of the U.S. International Trade Commission. Established in 1991 as a partnership between industry, academia, and the government, C3R works on a wide variety of projects with government agencies and diverse businesses of all sizes. 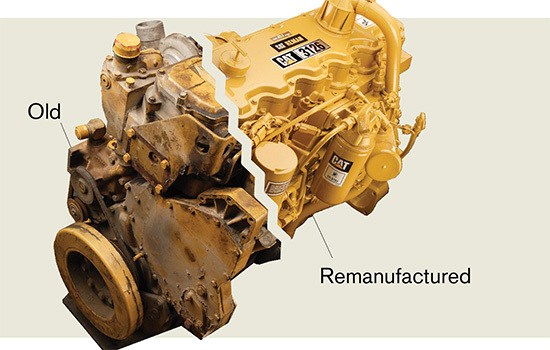 Remanufacturing involves a rigorous engineering process designed to return a worn or nonfunctional product to a “like-new” or “better-than-new” condition. Remanufacturing is not the same as recycling or repairing. A team of engineers begins a project by conducting an extensive analysis using a variety of “non-destructive inspection” (NDI) methods including ultrasonic imaging, computer-controlled scanning, or even a laser-vision technique designed by C3R for inspection of submerged welds in large steel tubes. C3R has also designed sensors and software systems that monitor equipment while it is in use to predict and prevent breakdowns. In partnership with the U.S. Marine Corps and the Office of Naval Research, C3R created a vehicle health management system that was deployed, in partnership with Lockheed Martin, on military vehicles and subsequently made its way to the commercial sector. Cost Evaluation: If the cost of remanufacturing exceeds 60 percent of the cost of new components, it generally is not considered worthwhile. Cleaning: “The most expensive, most labor-intensive aspect of remanufacturing is containment removal through surface cleaning processes,” explained Michael Haselkorn, senior staff engineer and research faculty, GIS. Restoration: C3R engineers design practical solutions for each project using, if possible, equipment and materials readily available to the sponsors. A variety of processes can be explored, including additive manufacturing techniques such as 3D printing, application of coatings using various methods, and laser engineered net shaping (LENS). In a project with the U.S. Marine Corps, C3R researchers helped solve a problem with drive shafts on Light Armored Vehicles (LAVs), which were failing when a coating separated, causing about 80 percent of these expensive components to be scrapped. C3R designed a process to remove the original coating and apply and machine a new coating using thermal spray techniques. This cost less than 22 percent of the cost of new shafts. The engineers also resolved the original design flaw. With access to more than $70 million in state-of-the-art equipment, testbeds, and laboratory facilities throughout GIS, as well as a diverse staff of more than 100, C3R is one of the premier remanufacturing research facilities in the world. Test and Recertify: Before a remanufactured product or component can go back into service, it must be thoroughly tested and determined to be “good as new” using simulations designed to demonstrate long-term performance. Training: The final step in each project is transferring the process to the client’s personnel. In addition, an important part of the center’s mission is providing hands-on technical training to industry through workshops and seminars. Beyond working with dozens of clients on individual projects, C3R, GIS, and Nasr are committed to promoting remanufacturing worldwide. Among RIT’s partners in this effort is Caterpillar Inc., which remanufactures more than 85 million tons of material annually. To that end, several key projects are underway at GIS. Following more than two years of research, the Technology Roadmap for Remanufacturing in the Circular Economy was published in 2017 by GIS with support from Energetics Inc. and the U.S. National Institutes for Standards and Technology Advanced Manufacturing Technology Consortia. The roadmap was unveiled at the World Remanufacturing Conference, which brought 150 industry leaders from around the world to Rochester last June. Also in 2017, GIS was selected by the U.S. Department of Energy to lead its new Reducing Embodied-Energy and Decreasing Emissions (REMADE) Institute—a national coalition of universities and companies focused on clean energy. This high-profile initiative represents a direct outcome of the work begun at C3R three decades ago. “We think we’re going to change the world,” said Nasr.